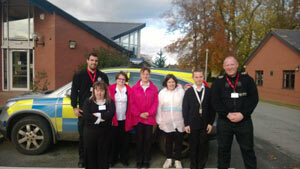 A policing team in Llangollen, Wales has set up a partnership with a learning disabilities college in Oswestry with the aim of promoting understanding and inclusion of disabled people in society. Over the past 12 months a group of police officers including: District Inspector Siobhan Edwards and Sergeant Paul Hughes have visited pupils from Derwen College in Oswestry to talk to them about the responsibilities and roles of the police within the community. Derwen College is a residential college for young people aged between 16 and 25 with varied learning difficulties including Autism, Downs Syndrome and other disabilities. The aim of the visits had been to give students the chance to develop knowledge of the workplace and learn skills to live as independently as possible. The collaboration has also been a positive experience for police officers because it has allowed them to meet the students and to gain an understanding of the difficulties faced by people with disabilities. Teachers and staff give presentations to visiting police officers about everyday life for students at the college. Both police officers and staff at the school are very happy with how successful the partnership has been and say they look forward to the visits continuing in 2014.